If you cut taxes, the environment for business necessarily gets worse over time because roads deteriorate, people are not as well educated, scientific research declines, along with about a million other things that businesses rely on. United Airlines lands in a new controversy after giant rabbit turns up dead. Tax cuts mean cuts to infrastructure, schools, health care, scientific research and all the things our government does to make our lives better — and to help our economy prosper. Infrastructure was one of the few actual policies that might have bipartisan support, except Trump is in it for himself and his contractor buddies. 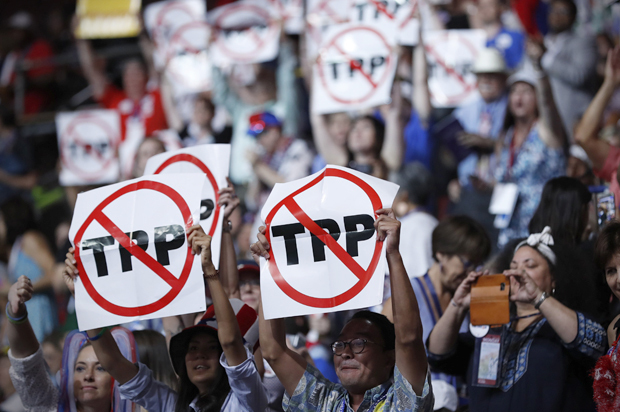 Trump Declares TPP Still Dead. So Now What? Though TPP was killed by a long progressive fight that resulted in it not having the votes to pass Congress, of course, he took credit for killing it himself. So now that that’s over, how should our country trade with the world? Reagan and both Bushes cut taxes for the rich and their corporations, promising that the "benefits" would "trickle down' to the rest of us. So did Kansas and Puerto Rico. How'd that work out for them -- and us? This isn't the first time a Republican President posed as a working class hero. In 2002 George W. Bush pandered to Rust Belt voters by slapping a 30% tariff on imported steel. While at Brietbart Steve Bannon didn't have to show a profit, just keep anti-Muslim billionaire Robert Mercer happy. His daughter Rebeckah is on Trump's transition team. Leaders of for-profit MSM are punished when their shareholders don't make money not when they fail the public. Trump threatened to slap a tariff on China. China demonstrates how it's not the one with something to lose. According to the New York Times, the market has rebounded because of Trump's charming lack of insanity for a couple of days.